Cook spinach in large nonstick skillet on medium-high heat 4 to 5 min. or just until spinach is wilted, stirring occasionally. Remove from heat. Cool 5 min. Blot spinach dry with paper towels; place in medium bowl. Add all remaining ingredients except mushrooms; mix well. 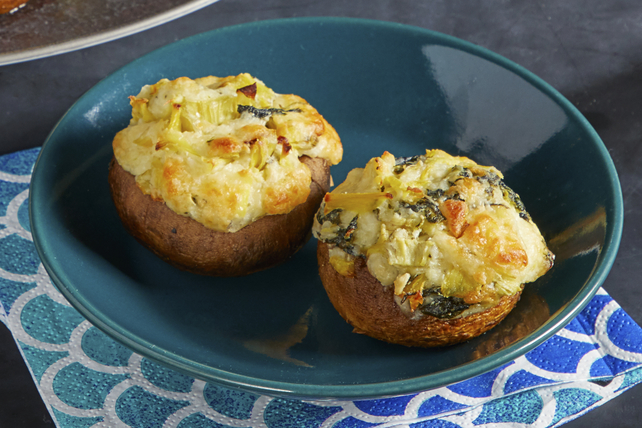 Fill mushroom caps with spinach mixture; place, filled sides up, on baking sheet. Bake 30 to 35 min. or until mushrooms are tender and spinach filling is heated through. The mushrooms can be filled with the spinach mixture ahead of time. Refrigerate up to 24 hours before baking as directed, increasing the baking time if necessary until mushrooms are tender and spinach filling is heated through.